Would definitely suggest Capsule to any traveler. It has a great atmosphere, awesome staff, and if you're a solo traveler, you're bound to meet people. Capsule is the best hostel I stayed in in my 5 month trip in Asia. The staff is so nice and knows how to make a good party. The beds are very comfortable. They have a nice pool and common area. It's the highest building in the area and it's really nice to watch the sunset on the rooftop. The best thing to do is the party bus to single find on Sunday, so much fun! I had a month in Bali and stayed for almost 3 weeks in total in capsule, I love it! A perfect place to meet people! Can be a little bit noisy at night. The rooms are clean and the bed is realy comfortable! Really liked my stay here. Leuk hostel en je ontmoet hier snel andere mensen. Ligging is in een zijstraat van de hoofdstraat. Proper beds and location. Just dont order breakfast since it took 1,5 hrs to make some eggs. Voor 1 nachtje is het prima, maar niet voor langer. Om 11 uur komt ‘housekeeping’ schreeuwend binnen. Ze zetten muziek op, zingen, schreeuwen en telefoneren zelfs in je kamer. Terwijl sommigen nog slapen. Daarnaast doen de kluisjes het vaak niet (gaan niet open), wij moesten 3x naar de receptie lopen. En ze openen het ook zonder controle waardoor eigenlijk iedereen makkelijk andermans kluis kan openen. Daarnaast hebben ze een movie-area, alleen doen de films het niet. 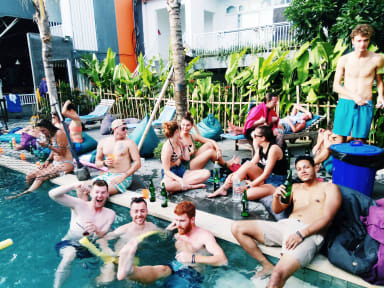 It’s a true party hostel and in most cases that is a lot of fun, the only thing is that there are three rooms (6 person) downstrairs next to the party area what gives you no choice to eather join the party or just not sleep. So sleep upstairs if possible.The lockers and the locks on the doors are good! Beds are comfy but there are blood stains in the sheets, didn’t noticed any bedbugs but it is a sign.. also caught one of the cleaning members doing a nap in someones bed during cleaning hours..?